Wow; Walter Trout….there’s a name from the past; and he’s taken the songs of Luther Allison; who is probably the Bluesman’s Blues-man, and lit a fire under them. Once described as a ‘guitar prodigy’ the guitarist is now regarded as a veteran, according to the Press Release and he will be, because he’s 62 years old. Not that you’d know it from the energy that tears through the majority of LUTHER’S BLUES. As a bit of a Blues-Rock fan, it’s a joy to hear Trout pay tribute to one of Blues Music’s most under-rated performers, Luther Allison. Walter comes out with both guns blazing on album opener,I’m Back and the title itself is quite apt, as Walter takes no prisoners on this archetypal Chicago Blues tune. Personally I fell out of love with Blues-Rock about 10 or more years ago when the emphasis went towards the rock end of the music with endless, mind-numbing solos that went on for days and Trout was guilty of that too. But here; he keeps everything in check; much like the Freddie King protégé Allison did and makes every passionate note sound as if it was going to be the last one he was ever going to play. Bad Love is a perfect example as Trout sounds like he’s going to cry as he forces the words out and his guitar playing teases towards ‘rock’ but never actually ventures over the line. Any song titled Low Down and Dirty is going to get my attention and boy; is this one worth listening too as it swings and sashays like a fat lass on a Friday night. 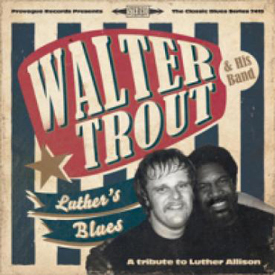 The absolute highlight of LUTHER’S BLUES is Walter’s version of Allison’s signature tune, Cherry Red Wine and while it’s not actually note for note faithful to the original; as Trout pouts his very own note bending stamp on it; and will rekindle many a Blues fire among the Rock fans who buy his work these days. While Luther actually recorded an album (on Motown of all labels) called Luther’s Blues; this album is made up of 11 tracks from across his career and might even equate to a Best Of; plus Trout closes the set with a very personal slow and soulful tribute with, When Luther Played the Blues which has playing and singing from deep within his heart and might be one of his finest moments on record.